1 Master w/King, 1 w/Queen, 1 w/Pyramid Bunk. Guest Linen Option. Beautifully furnished, Soundfront cedar shake cottage has been completely renovated with all the comforts of home. What a location! Located right on the sound on tranquil Bay Drive. Beautifully landscaped with your own pier and boat mooring. The furnishings and decor are comfy. Features stainless steel appliances, hardwood flooring and flat screen tv's. 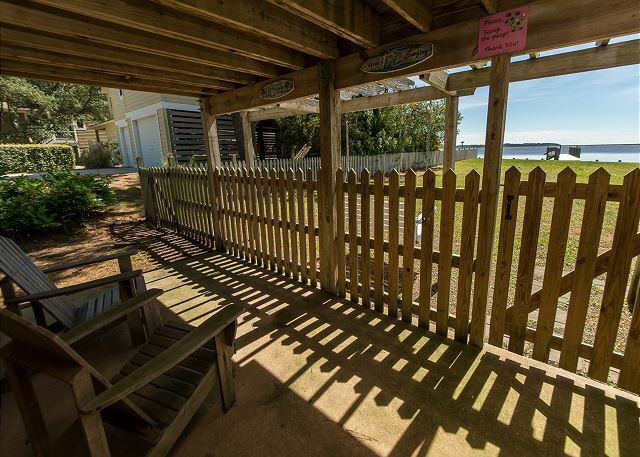 Screened porch for morning coffee or evening cocktails while you watch the colorful Carolina sunsets. Large deck with a hot tub and deck furniture. Great for sunbathing and star gazing. The four legged member of the family is also welcome with lots of fenced yard to romp in. Great access for kayaks or canoes. A few houses down is the community boat ramp for larger boats with a mooring just off the pier for your boat. 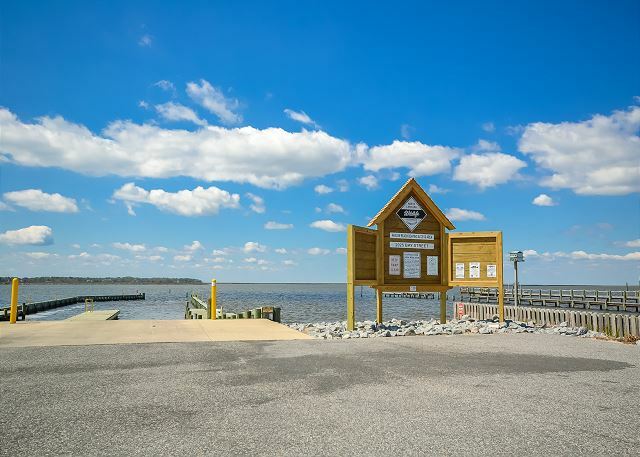 Your own dock is great for family fishing or crabbing. Close to grocery stores, restaurants, shopping, putt putt and movie theaters as well as local attractions like the Wright Brothers Memorial and Jockey's Ridge Sand Dunes. Make A Change in Latitude your Vacation Home and let the Memories begin! 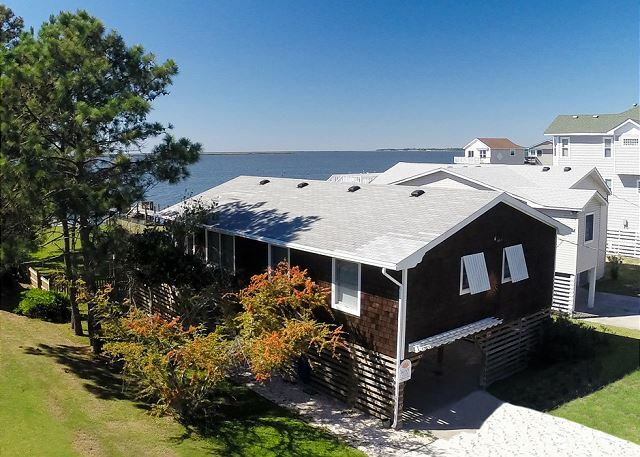 Outside: Private Pier w/seating, Boat Mooring, Large Furnished Sound Front Deck with Hot Tub, Furnished Sound Front Screened Porch w/Ceiling Fan, Large Fenced Sound Front Yard, Outdoor Shower, Tiki Bar. One Level: Kitchen w/Stainless Steel Appliances (Microwave, Range/Oven, Dishwasher, Refrigerator w/Icemaker), Dining Area w/Seating for 6, Great Room w/46" Flat Screen TV and DVD, King Master Bedroom w/40" Flat Screen TV and DVD, Queen Bedroom w/40" Flat Screen TV and DVD, Pyramid Bunk Bedroom w/Flat Screen TV and DVD, Sunroom, Washer & Dryer, Ceiling fans in every bedroom/Great Room/Sunroom. Runners get free early check in and late checkout! If you are particating in an Outer Banks Marathon Event, you can receive free early check in at 1 p.m. on arrival, and late check out 12 p.m. on departure. This excludes homes that are over 6 bedrooms, and homes in Carova. Please call to book 1-800-635-1559. This property was thoughtfully supplied with kitchenware. Views of sunsets unmatchable. Unfortunately, property was in great need of exterior cleaning (windows wells black with dirt; huge spider webs); interior dust on furniture thick/very obvious. Property manager provided quick response to address issues of interior dust. Outstanding views of the sunset over the sound! Response from Beach Realty of North Carolina, Inc.
Raymond, we are glad you enjoyed that! We hope to see you again soon! Cottage was just the right size, very neatly decorated with erfect eminities. We decided to try "sound side" and glad we did. Fenced back yard was perfect for our dog. Location was centrally located. Beach Realy customer service was excellent. Reservations were simple, check-in was simple. We will be back. Thank you! Thank you taking the time to leave us such a wonderful review. We are glad that you and family loved A Change in Latitude, and our dedicated staff will be pleased to learn of your high praise. Sound side vacationing has so many positive attributes that most people do not realize. There is no better place to watch the sunset then on the sound. We look forward to welcoming you and your family back again in the near future. This was our favorite house EVER!!!!. It was the perfect size for our family of 3 plus our dog. We will definitely stay here again next year if it is available. Dena, we are so happy that you enjoyed your stay! Thank you so much for sharing that with us! To pre-reserve for next year give us a call at. Dena, we are so happy that you enjoyed your stay! Thank you so much for sharing that with us! To pre-reserve for next year give us a call! We hope to see you in 2018! I loved this house. I hope to stay here again in the future. I loved the fenced in yard for my dogs and I loved the pier. Great sunsets! Nice community with lots of places to walk dogs. Tracine, thank you for sharing with us! We are so glad you enjoyed the house. We hope to see you again soon! This house was perfect for our whole family! This was our first time renting a house, do we decided that we might as well bring the dog along too! This place is great for dog owners. The fenced in backyard was nice for letting her out, plus there's a nice paced walkway just 100 yards from the property. 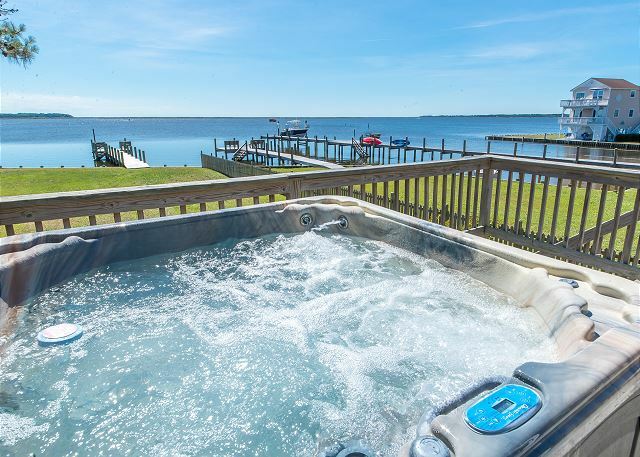 The house is located in Kill Devil Hills, so you're close to everything you need. Loved every part of our vacation and coming "home" each night was an added bonus. Stephen, thank you so much for taking the time to share your thoughts with us! We are so thrilled that you enjoyed the property, and the owner will be too. We hope to see you again soon! It was very good, all except for the inconvenience of water leaking from the ceiling in the bunk bedroom upon our arrival. Maintenance had already began to take care of the problem by having two fans running along with a bucket to catch dripping water when we arrived the first day. Thank you for taking the time to provide us feedback regarding your recent stay at "A Change in Latitude." We are thrilled to hear that you enjoyed the view and the location of this property. Unfortunately we do encounter issues on turnover days but do our best to have them rectified as soon as possible with little inconvenience to our guests. We hope to welcome you back to the Outer Banks again in the near future. Charlie, we are glad you enjoyed yourself! Hope to see you again soon! We loved our week at A change in Latitude. The location was great, the sunsets were stunning from the deck or dock. The bike path was wonderful, house was cozy, and the hot tub was the cherry on top. There was a lot of seaweed around the dock, which clogged our jet ski. I am so thankful to have had my two dogs with me. There were a tons of spiders outside, so perhaps a quick extermination may help. There was also one crabby neighbor a few doors down, who the management was very quick to help with my concerns (although there was a bag of rotting dead fish left in our truck bed a few days later). The house was very clean and kitchen was well stocked. Furniture was very comfortable, including the beds. Only negative was the tiny shower in the hall bathroom. Sunset views were awesome every day. Karen, thank you for sharing your feedback with us! We really appreciate it. We hope to see you again soon! This rental was perfect! Great set-up for a family of 4 and a small dog...nice fenced in yard, plenty of room for everyone, and well equipped. The kitchen has everything you'll need and the sound water is not fishable (too much grass in the water), but is perfect for kayaking/canoeing. Thanks for a great stay! We stayed for two weeks as Hurricane Joaquin threatened (but never fully arrived at) the Outer Banks. We had too few sunny days, but fortunately we were safe and dry in A Change in Lattitude. We choose this house because of the sound front location and fenced in yard. The house is nicely updated with very comfortable furnishings. The kitchen was stocked nicely from dinnerware to appliances (there were 2 crockpots). There is nothing negative about this house. Our dogs enjoyed the fenced in yard and we enjoyed letting them run around. The dock was nice for crabbing and launching our kayaks. We saw some amazing sunsets as well! We will most definitely rent A Change in Latitude again and highly recommend it for anyone. My family enjoyed the relaxing, quiet area on the sound. The interior was comfortable and well designed and the deck was a perfect spot to watch the sunset. The fenced yard was especially appreciated for the dog. A great place to stay if you want to be close to the water. The house was prefect for us. The dogs loved the fenced in yard. The location was quiet. The hot tub was great. Thank you for your review. You are right, the home is perfect for a family with a dog! We are happy that the home met your needs and we hope to see you next year! This charming cottage was EVERYTHING I hoped for and MORE! Not too large, efficient, easy access to main level, beautiful furnishings and décor. 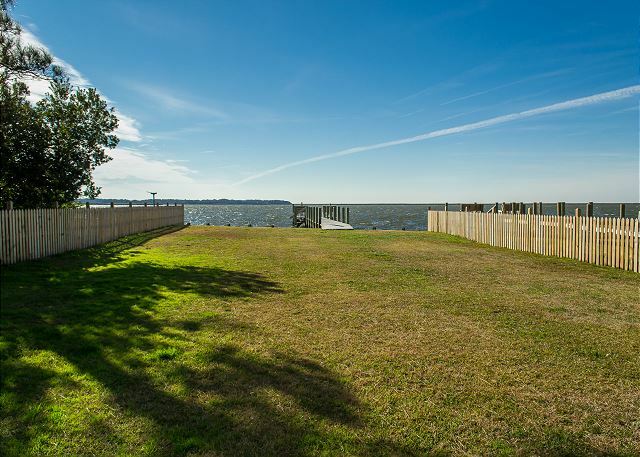 Huge fenced yard for the dogs, a terrific pier, and the sunsets! Wow! Couldn't have asked for anything better. Thank you for your feedback regarding "A Change in Latitude!" You certainly nailed all of the amazing features this cozy cottage has to offer. We are thrilled to hear that you enjoyed your stay and look forward to welcoming you back again in the future. Thank you for your feedback regarding "A Change in Latitude." The location and setting of this home is truly amazing and we are thrilled that you had the opportunity to enjoy the serenity that a sound front provides. We look forward to welcoming you back to the Outer Banks in the near future. Kitty Hawk Rentals would like to thank you for the feedback you have provided regarding our property "A Change in Latitude." 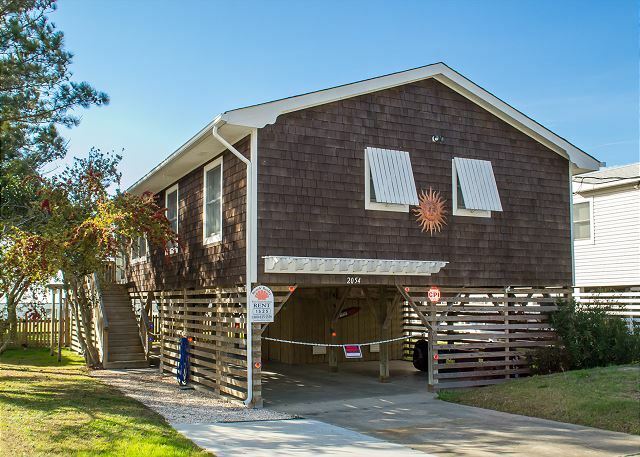 This amazing Soundfront house is set in the perfect location and certainly makes for a great family stay at the beach. We are thrilled to hear that you appreciated the beautiful decor and comfortable furniture. We look forward to welcoming you and your family back to the OBX for many more years to come! We had a wonderful time at this location. The house was decorated so pretty and very cozy. We usually stay on the ocean side but this was our first time on the sound and we loved it. We will be back next year on the sound. The views are beautiful. We did get to see a lot of wildlife as well. We spent most of our day on the pier fishing and crabbing. So much fun. This is one of our most popular homes and for all the reasons that you stated! Its clean, quaint and very cozy. I am partial to sound side homes as well; a little more slow paced. The wildlife is definitely a perk to being on the sound side! We hope you had some great catches. Our stay was wonderful, the fenced yard made all the difference with two dogs! The house is beautifully decorated and very clean. Thank you so much for taking the time to leave a review! We love this home too. The owners take great pride in their home and truly care about the guest experience and will be thrilled to read this. We hope to see you next year. The location of this property is perfect. We came to celebrate life with out mother who is battling cancer. While she does not have much energy, she was able to relax and float safely around the sound right off the dock. Aside from really tall grass and a few dangerous deck board the place was in good shape. I was so happy to find a pet friendly rental, however, the housekeepers had not exactly cleaned up from the last pet. All in all I would recommend this property to a friend!!! Quality for the cost!! !